It is no use practicing darts if you have set up the dart board wrong! Maybe you have given your best and practiced for hours at your home, just to fail big once you start playing at your local pub or a tournament. 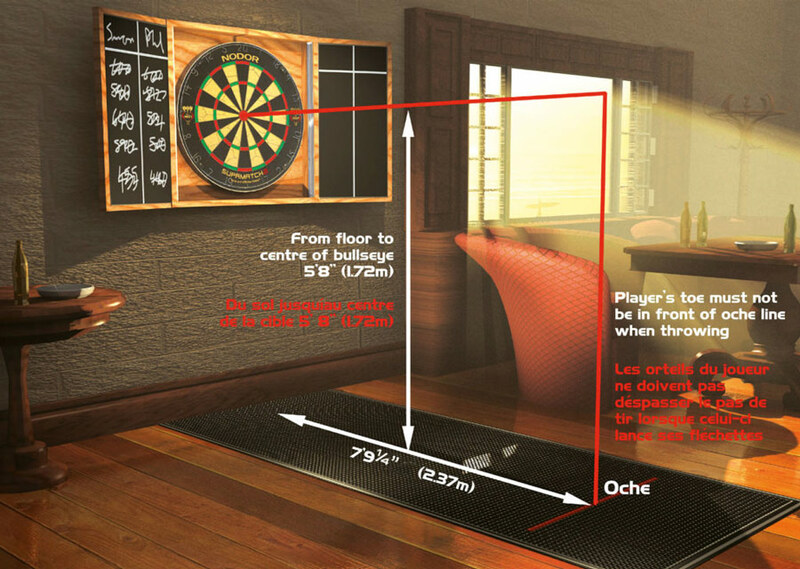 It might seem trivial, but your dart board height and distance might be off and cause such bad results. 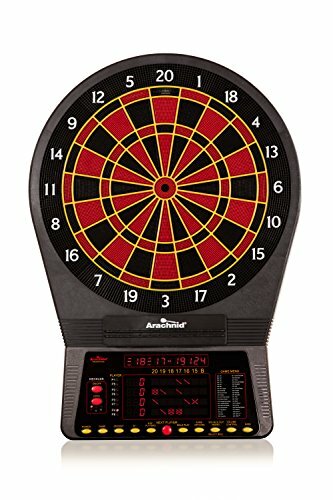 If you repeatedly throw darts at a board that is set up 10 feet away and at some approximate height, your brain and muscles will get trained and memorize the perfect position, speed and technique to always score. Unfortunately, that will not do you much good when you start throwing darts at the regulation dart board. It is therefore essential for you to learn how to set up the dart board properly. In this way, your results will be consistent, and you will be able to triumph wherever and whenever you play darts. 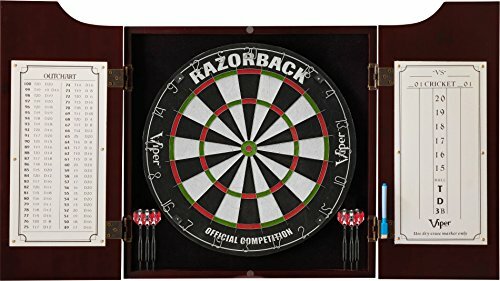 What Do You Need To Set Up A Dart Board Properly And Play Darts? How to Quickly Check If You Have Measured Appropriately? 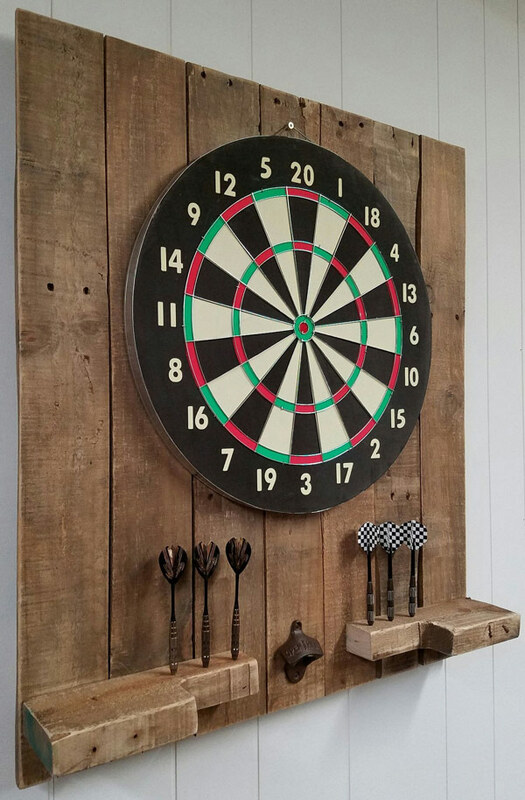 If you want to take a traditional approach, choose the bristle dart board. They are most often made of a material called sisal which is grass-like hemp or natural fiber. Sisal is the same material used to make ropes, and it is highly resistant. When the dart hits the bristle dart board, the fibers give way to its tip and do not get damaged making this type of dart board very durable. 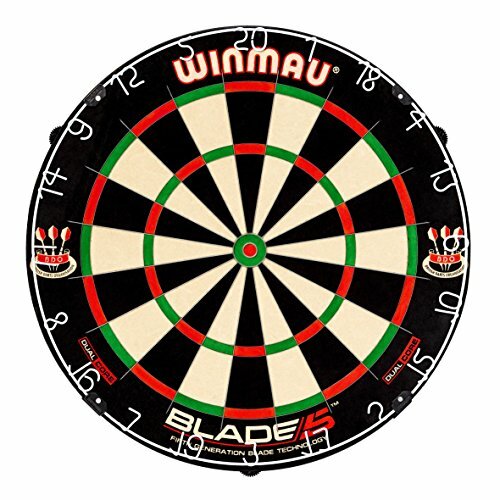 Winmau Blade 5 is our choice for best bristle dartboard. 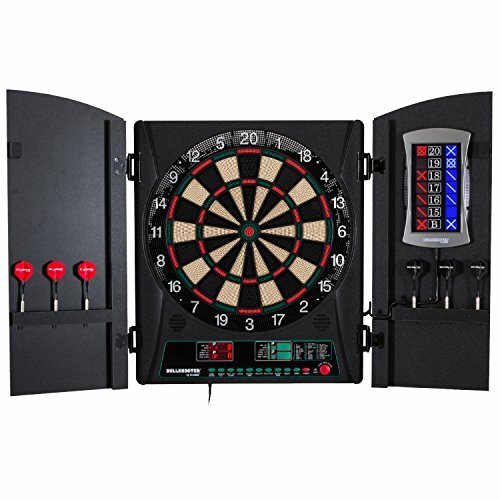 If you are a modern man and want to take a modern approach when choosing your dart equipment as well, opt for an electronic dart board. These boards are not much different from the bristle ones when it comes to the layout. The difference lays in the sensors located underneath the surface of the board. These sensors react to the hits of your soft tip darts and display your score. Most of the electronic board also offer an option to keep your scores automatically which can be very practical and prevent disputes among players. There are models that run on batteries, but most often you will have to secure an electric outlet as to plug in the provided AC adaptor that powers the board. There are both LED and LCD score displays, but the LED ones are easier to read and thus make a better choice. Arachnid Cricket Pro 800 is truly one of the best options in the industry. In order to avoid confusion, there are standard international dart board measures that most of the manufacturers respect to the letter. A standard dart board, or as some call it a “clock” board, measures 18 inches in diameter. It is divided into twenty numbered segments that resemble pieces of pie and are all the equal size. Each pie-like segment features a double ring on the outside perimeter of the scoring area plus a triple ring on the interior area. When you hit the field in a double ring that counts as a double of the number displayed on it. If you hit the same number in the triple ring, you score triple of that number. In the center of the board stands the bull’s-eye, every player's favorite. Similar to the pie-like segments, the bull’s-eye has an outer bull and an inner bull area. If you hit the outer bull which is also referred to as the single bull, you will score 25. Hitting a double bull’s-eye (inner bull area), will double your score to 50. Brass: Brass darts are not expensive but are also easy to handle and light. They are excellent for beginners but not the kids. 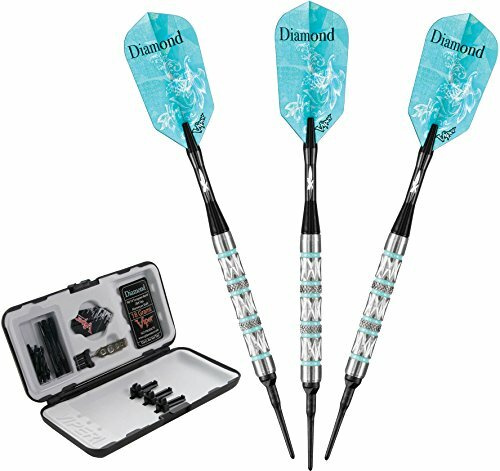 Nickel-silver or tungsten: These darts will provide more speed to your throws due to being heavier. However, it is more difficult to control them and thus make a better choice for more experienced players. 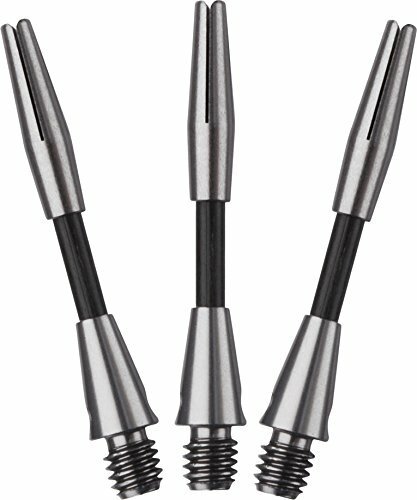 The soft-tip darts are most often flexible and made from a material such as plastic or polyester. They are 100% safe and can be used by children as well as the adults. These are the small wings located at the end of your dart. They are most often made from synthetic materials and there about twelve different flight shapes for you to choose from. Shafts enable you to fine-tune your darts and can be replaced whenever needed. They come in six different lengths. 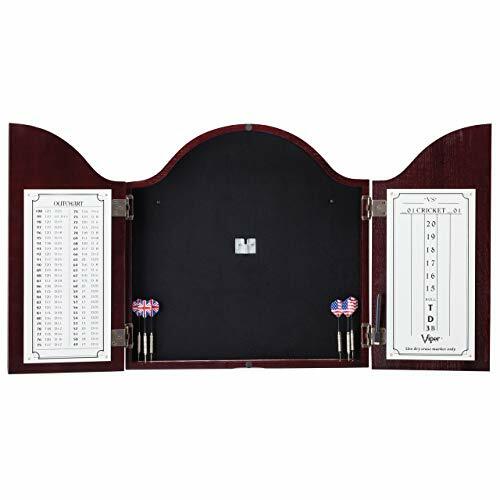 Cabinet can help you organize and protect your dart equipment but also the wall the board is mounted on. To avoid disputes keep the scores on the scoreboard where everyone can see them. You can choose between a chalk scoreboard or a dry erase one. It needs to be kept safe from the darts that go wrong. ​You should invest in this guardian if you do not want your beautiful wall to be filled with holes like Swiss cheese. 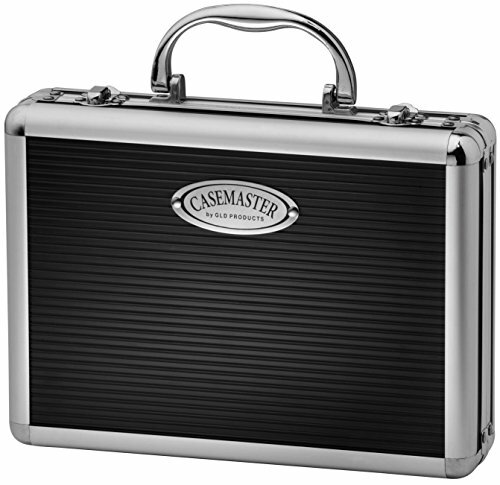 If you often carry your darts with you, invest in a ​best carry case that will enable you to transport them safely. 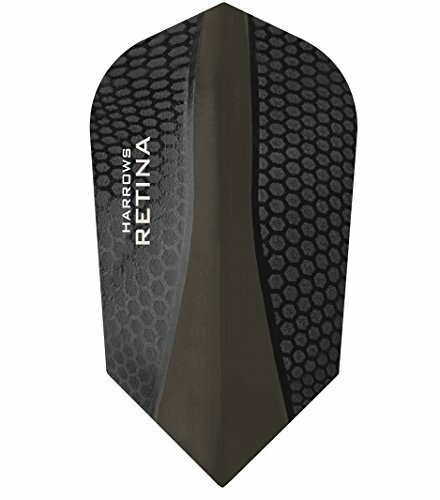 A needed one to help protect the floor, protect your dart and help you comply with the rules of the game by highlight Oche lines. 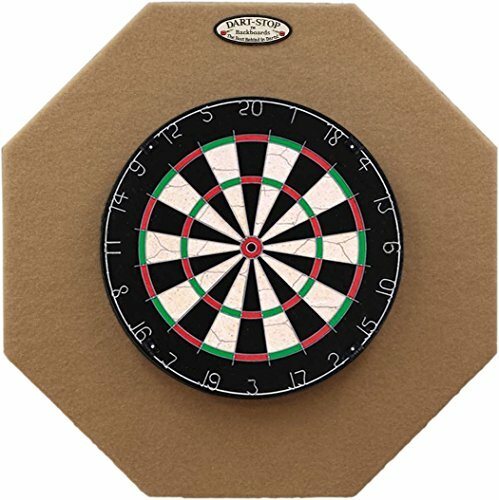 There are several players in the market and we will help you find the best dart mat in a fast and reliable way. The room you choose to set up your dart board in should be big enough not only for the person who throws darts but also other participants that need to stand at a safe distance. Try to keep the room clean and take out anything that is not necessary for the game. The lighting should be good. As far as the flooring is concerned, the best option is to place a dart mat on it or at least a carpet. The worst case scenario is a concrete floor or tiles as both can damage the dart tips. As darts tend to bounce off the board, avoid mounting the board near the window or any breakable items. People should not stand near or walk between the throw line and the dart board either. To protect the wall, place the board in a cabinet or at least add a piece of plywood (4×4 and quarter-inch thick) behind it. If you want to feel like in a pub, acquire three yards of green felt and spread it onto the wall. The throwing line can be defined as a line on the floor you must never cross, or at least while throwing darts. You can either simply draw a line on the floor, use a tape to mark it or place a raised bar made of wood. 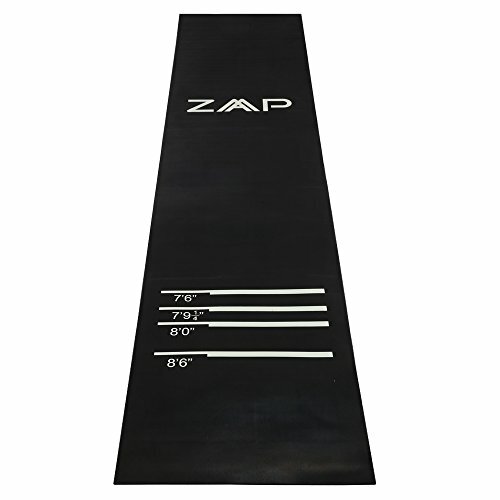 If you opt for the bar, you should know that it is known as the "oche" or "hockey" and that it should be around one inch high and two feet long (or more). In my opinion, oche is the better option as it actually blocks the foot of the player and makes the overstepping incidents inexistent. That eliminates a lot of arguments, believe me! The correct measures are prescribed by three major governing bodies – the British Darts Organization (BDO), the World Darts Federation (WDF), and Professional Darts Corporation (PDC) and in this section, we will deal with them step by step. This is a simple device designed exclusively for the purpose of measuring the distance from the front of the board to the throwing line or the oche. If you cannot get a hold of ochemate, a plain old tape measure will do just fine too. 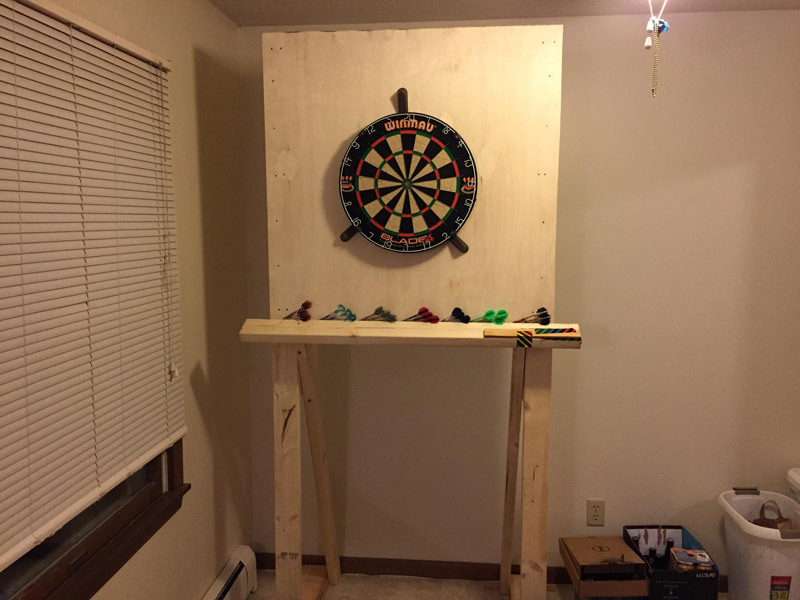 Watch a professional Dart Board Set Up Video. You should position your dart board 5 feet and 8 inches (173 cm) from the floor to the center of the bull’s-eye. This is always the case; it does not matter if you have a bristle or electronic board. This measurement will depend on the type of the board you have. First of all, draw a line from the bullseye to the ground and then set the distance to the throwing line (not from the wall but from the point where the line hits the floor). A bristle board should be 7 feet and 9 1/4 inches or 237 cm, away from the oche. An electronic board should be exactly 8 feet away. 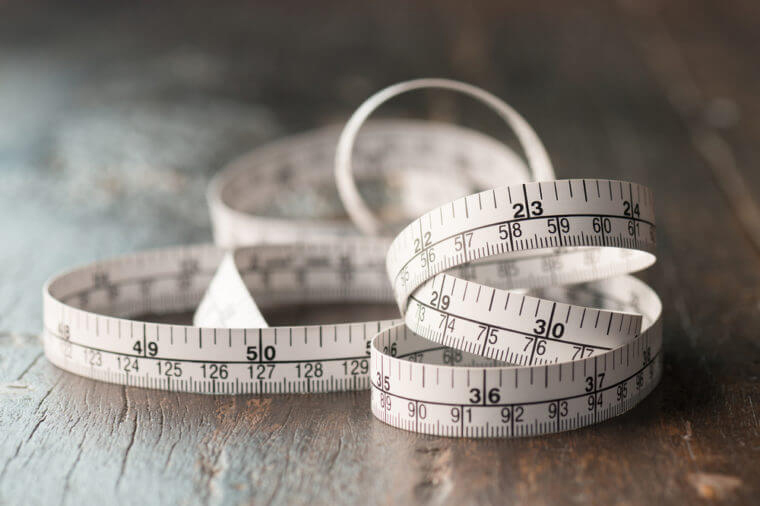 The third measurement you have to get right when honoring international standards is the distance between the center of the board and the oche, and it should be 9 feet and 7½ inches, or 293 cm. Mind that this is the horizontal distance between the front end of the toe line and the front end of the board! The board must not lean forward but rather be positioned flat to the wall. Number 20 should be at the top if you have a scoreboard mount it left or right of the board. Every board comes with a clip you need to mount it to the wall. The screw that is behind the board goes into the clip. Therefore, do all the necessary measurements to decide where exactly the bullseye should be and then mount the clip at the correct height. The screw on the board will snap into the clip, and you can proceed to fix the board with cardboard or wooden chocks. If you want to quickly check if your dart board is mounted at the correct height and distance, simply measure the diagonal line from the Oche to the center of the bull’s eye. It should be exactly 293 centimeters (9 ft. 7 3/8in) long. If you got it right, congratulations! If not, give it another try! Although most of the people around the globe will follow the general rules and standard measurements when mounting the dart board, there can still be some deviations. Sometimes board heights or throw-line distances can be different. The difference that is most often applied is that already mentioned- between the bristle and electronic board set-ups. So, you need to pay attention to this section as it will give short advice on how to set up the dart board depending on the type of the board you have or the game you play. In this way, you will always be able to do it yourself without making any mistakes. Mount it so that the center of the board is exactly 5 feet and 8 inches away from the floor. Check if the diagonal line from the bullseye to the throw line measures 9 feet and 8 inches long. Measure the distance in the same way as described above but make sure that he throwing line is exactly 8 feet away from the wall. The diagonal line from the bullseye to the throw line should measure 9 feet and 9 ½ inches long. If you have carefully read the text and noted down the all the measurements, you are now able to set up your dart board properly. Dart board height and distance will never be off again, and you will be able to standardize your throws and game and achieve consistent results! Try to remember all the advice I gave you, but also feel free to offer me some useful tips or share your experience regarding the proper set up of your dart board! 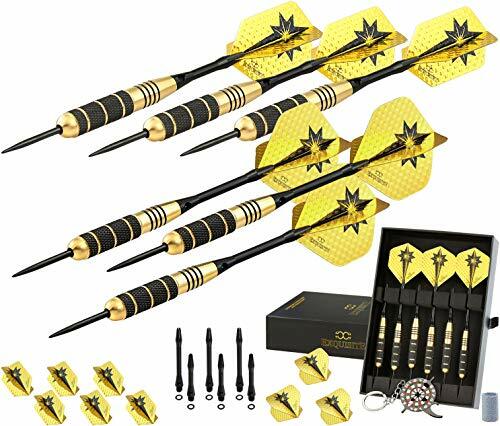 If you throw a dart into the board at the bullseye and hit in the bullseye, then throw and hit the rear of first dart, ending with second dart sticking out rear of first dart, does second dart count the same score as first dart its sticking out the end of? 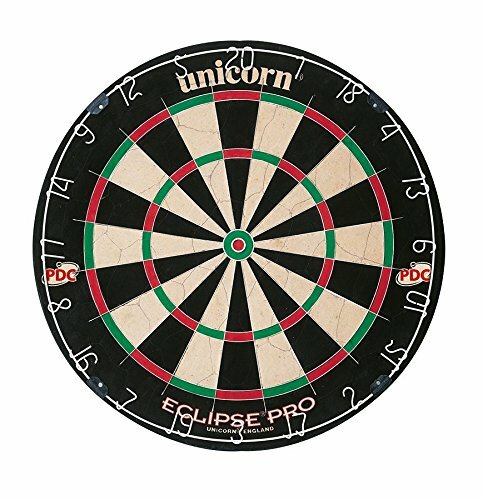 Are the rules and distances for bristle dart boards, the same for wooden dart boards?